An assassin (Mark Wahlberg), who gave up his carefree-killin' lifestyle after accidentally shooting an innocent person, is convinced to return for one last job. However, after being framed for assassinating the president, the killer must find the real shooter and clear his own name. $8.364 million on 2806 screens. On first glance, 2007’s Shooter looks like any of a million cheap straight-to-video action flicks. However, surfaces deceive, as the movie actually provides a pretty good little thriller. We meet military sniper Bob Lee Swagger (Mark Wahlberg) and his partner/best friend Donnie (Lane Garrison) on an assignment in Ethiopia. The situation goes bad and Donnie dies. This leaves Swagger disillusioned, so he retires to a secluded mountain cabin. During his respite, authorities led by Colonel Isaac Johnson (Danny Glover) come a-calling. He states that an assassin will try to take out the president (Tom Butler) from a distance of more than one mile. One of the few people qualified to make that sort of shot, Swagger can help them analyze the danger and deal with it. With reluctance, he agrees to do so and sets up shop in Philadelphia, the location Swagger believes would work best for the assassination. Problems arise, however, and someone shoots Ethiopian Archbishop Desmond Mutumbo (Dean Monroe McKenzie). Swagger soon finds himself framed for this killing and on the run. 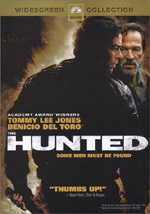 Though wounded, he escapes and seeks help from Sarah (Kate Mara), Donnie’s widow. Eventually, Swagger also gets assistance from FBI Agent Nick Memphis (Michael Pena), the only member of the feds who suspects our hero might be innocent. The movie follows Swagger’s attempts to clear his name and exact revenge on those who made him suffer. As my friends know, I don’t much like to admit when I’m wrong. However, Wahlberg is slowly forcing me to reassess his acting skills. For years, I’ve called him wooden and flat, but with flicks like Shooter and 2006’s The Departed, Wahlberg finally has started to develop into a real actor. No, he’s not as good here as he was in Departed. There he somehow managed to out-act much superior performers, while the stoic, taciturn Swagger requires less heavy lifting. Nonetheless, Wahlberg provides a pretty strong performance in Shooter. Again, this isn’t the kind of role that forces him to tax his skills, as Swagger remains firmly in the stone-faced realm. However, when confronted with similar personalities in movies like Planet of the Apes or The Yards, Wahlberg came across as much less believable and interesting. He manages to make a predictable, one-note character into someone more intriguing. I didn’t think he had it in him. Along the same lines, director Antoine Fuqua manages to moderately elevate Shooter over its genre trappings. As I mentioned at the start, the film looked like it’d be a simple action flick without much more to offer. Fuqua gives the movie some pizzazz, though, as he turns it into a surprisingly gritty piece. This means more violence than I expected, a factor that could become a positive or a negative. I think some viewers may be taken aback by the graphic nature of some shots, as Shooter doesn’t present like the kind of flick that will bring out that sort of material. On the other hand, the gore doesn’t become gratuitous, and it means that the movie doesn’t become neutered. The violence gives us a more immediate feeling for events and ups the ante; this isn’t a cartoony rendering of the action. Though the plot occasionally threatens to become muddled, it never quite suffers from that problem. I won’t spill the beans, but the conspiracy involved feels reasonably believable and matches the current state of the world in a convincing manner. Flicks like this always require some suspension of disbelief, but I thing Shooter stretches credulity less than usual. All of this adds up to an above average genre flick. At no point doesn’t Shooter threaten to become a classic, and it reinvents no wheels. However, it entertains as it provokes to create a consistently involving movie. 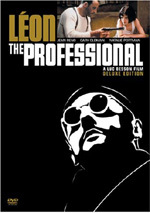 Shooter appears in an aspect ratio of approximately 5:1 on this single-sided, double-layered DVD; the image has been enhanced for 16X9 televisions. All aspects of this transfer looked very good. Across the board, sharpness seemed solid. Even in wide shots, the movie stayed crisp and well-defined. No edge enhancement cropped up and I noticed so signs of softness. In addition, the flick presented no shimmering or jagged edges, and source flaws failed to materialize. Given the movie’s gritty nature, I expected a somewhat subdued palette. The colors of Shooter fell into line to a degree, but they offered more vivacity than expected. The tones came across as reasonably full and they worked nicely within the flick’s design parameters. Blacks were deep and dense, while low-light shots offered very good clarity and delineation. I couldn’t find any reason to complain about this excellent presentation. In addition, I felt very pleased with the Dolby Digital 5.1 soundtrack of Shooter. The movie’s many action sequences allowed the soundfield to shine. From the opening battle in Ethiopia to car chases and other gunfire scenes, the mix opened up well to use all five channels to very positive effect. Elements engulfed us naturally, blended smoothly, and moved well. Audio quality was quite strong. Speech always remained crisp and distinctive, and I noticed no edginess or other issues. Music appeared lively and robust, while effects followed suit. Those elements seemed clear, accurate and dynamic. Bass response was deep and rich. Overall, this mix added a lot to the movie. In terms of extras, we open with an audio commentary from director Antoine Fuqua. He provides a running, screen-specific chat. Fuqua goes over story and character choices, cast and performances, attempts at realism, sets and locations, cinematic inspirations and technical choices, stunts and action, cinematography, and other production subjects. Does Fuqua cover all the expected topics? Yes – I can’t fault the breadth of what he discusses. Does Fuqua create a memorable or involving chat? No, not particularly. The director goes over the material in a somewhat dry manner and lapses into silence a little too often. He gives us a perfectly serviceable chat, but it never turns into anything especially interesting. A documentary called Survival of the Fittest: The Making of Shooter lasts 21 minutes, 49 seconds. It mixes movie clips, shots from the set, and interviews. We hear from Fuqua, author Stephen Hunter, producer Lorenzo Di Bonaventura, screenwriter Jonathan Lemkin, military technical advisor Patrick Garrity, and actors Mark Wahlberg, Michael Pena, and Kate Mara. The show looks at the original novel and its adaptation, what drew Fuqua and others into the project, sniper training and military elements, action scenes, locations, and the movie’s tone. “Survival” doesn’t do a lot to elevate itself above the “electronic press kit” level. Nonetheless, it includes enough information to succeed. The best parts come from the notes about military pieces in the film; these add good background. Overall, this is a decent featurette. Next comes a featurette entitled Independence Hall. This seven-minute and 15-second piece includes remarks from Garrity, producer Ric Kidney, park rangers Don Stanko, Lawrence McClenny, Holly Johnson and Cherie A. Butler, and park superintendent Dennis R. Reidenbach. “Hall” includes notes about the Philadelphia location, with an emphasis on historical facts. That makes it a tight little encapsulation of those areas. Seven Deleted Scenes fill a total of 11 minutes, 48 seconds. We find “Nick Memphis Intro at FBI” (2:37), “Timmons in the Alley” (1:11), “Sarah and Swagger Discuss Conspiracy” (1:26), “Extended Shopping Scene” (2:48), “Swagger and Memphis At the River” (0:48), “Swagger and Memphis Driving After Farmhouse” (1:15) and “Swagger and Memphis in Hotel Room” (1:42). Some of the scenes offer information handled more efficiently in the final cut. “Intro” is fun but not necessary to tell us that Nick’s the new guy, and “Timmons” and “Conspiracy” work better in the flick’s quick recaps. The three “Swagger and Memphis” clips come across as a little preachy; they get into political thoughts and make matters too explicit. I will admit I think “Shopping” should have ended up in the movie, though. It adds some much needed humor to the Swagger character and shows us how he and Memphis amassed their arsenal for the climax. The DVD starts with some ads. We get promos for Zodiac and Black Snake Moan. These also appear in the Previews area. No trailer for Shooter shows up here. 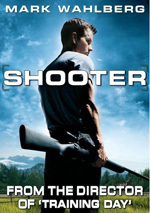 Mark Wahlberg shows uncommon signs of life as an actor in Shooter, an intriguing and gritty action flick. Imbued with a sense of Seventies paranoia along with its violence, the movie turns into a stimulating affair. The DVD presents excellent picture and audio along with a roster of decent extras. I like the flick and think the DVD deserves a look.